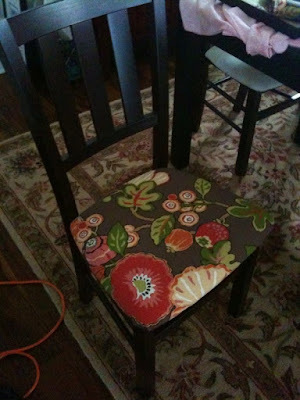 I'm finally covering my dining room chairs this weekend. I hate to even call them "dining room chairs" because they are just chairs from Target that are hardly big enough for my big 'ole behind much less anyone else over the age of 8. One day I will have grown up dining room chairs, but for now, we're dealing. This is actually outdoor fabric (I may have mentioned that before) so hopefully it'll be easy to keep clean. I also thought it blended well with the rug after it arrived, but now that I see it on the chairs...eh...a bit busy for my taste. Again though, we're keeping it for now. NYC - Day 3 and ADIOS!